A new study in the BMJ journal demonstrated a strong correlation between consumption of fruits and vegetables and a reduced risk of mortality. The researchers followed the lives of 65,000 Brits in the span of 7.5 years. 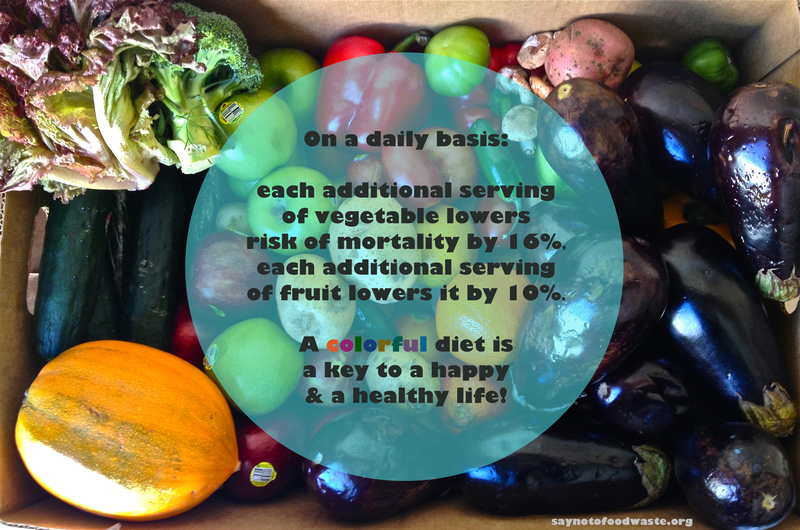 They noticed that increased consumption of these colorful and vitamin packed foods greatly reduced the risk of death. Those who consumed seven servings of fruits and veggies saw their risk of death from any cause decrease by 42%. The cause of dying from cancer was reduced by 25% and heart disease by 31%. Those who consumed less than seven servings were still experiencing better results than those consuming no vegetables or fruits. The most incredible part is that these findings held strong even when data was adjusted to reflect factors such as age, smoking, alcohol intake, socioeconomic status, Body Mass Index, education, and physical activity. With further analysis, researchers found that for every additional serving of vegetable we consume, our mortality risk is reduced by 16%, as opposed to 10% with fruit. Wishing you all lots of colorful eating! Posted on April 7, 2014 April 7, 2014 by saynotofoodwastePosted in NewsTagged colorful, diet, forbes, happy, health, sustainable.